The 250th St. Patrick’s Day Parade in New York City took place yesterday and it was a beautiful day for it. We’re still trying to get the green hues in our vision back to normal. Alas, this pressed us to take a look at some current trends in shades with an inspired and colored spirit. But this time, we mean eye wear! For both those with hindered or perfect vision–what we found could work for sun protection, too. Like The Shade Store, Tom Davies takes pride in custom-made products, with his Web-based innovative system for designing the perfect-fit specs. And our personal favorite is the more affordable “try-them-on-at-home or -virtually” model of Warby Parker. They take a very friendly TOMS Shoes-type approach to social responsibility – delivering one pair of glasses to someone in need for every pair that they sell. And, finally there’s Alain Mikli—the famed European designer of the original Shutter Shades we all came to love in the 80s—still making sturdy, functional eyewear for the masses today. 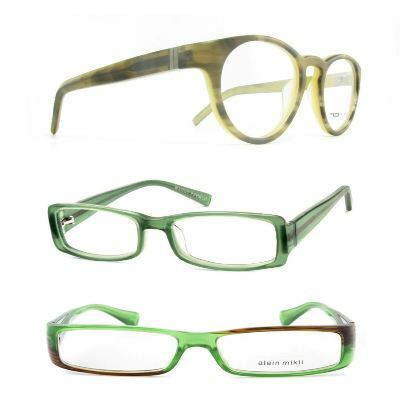 Above we’ve compiled three pairs of green shades to keep you in the spirit of St. Patricks Day. I know what I’m doing on my lunch break.